Today the Church celebrates the optional memorial of the Most Holy Name of Jesus. According to the 1962 Missal of Bl. John XXIII the Extraordinary Form of the Roman Rite this feast is celebrated on January 2. In the liturgical revisions of Vatican II, the feast was removed, though a votive Mass to the Holy Name of Jesus had been retained for devotional use. With the release of the revised Roman Missal in March 2002, the feast was restored as an optional memorial in the Ordinary Form on January 3. The Church reveals to us the wonders of the Incarnate Word by singing the glories of His name. The name of Jesus means Savior; it had been shown in a dream to Joseph together with its meaning and to Our Lady at the annunciation by the Archangel Gabriel. Devotion to the Holy Name is deeply rooted in the Sacred Scriptures, especially in the Acts of the Apostles. It was promoted in a special manner by St. Bernard, St. Bernardine of Siena, St. John Capistrano and by the Franciscan Order. It was extended to the whole Church in 1727 during the pontificate of Innocent XIII. The month of January has traditionally been dedicated to the Holy Name of Jesus. According to the 1962 Missal of Bl. John XXIII the Extraordinary Form of the Roman Rite, the feast of the Holy Name of Jesus which is kept on the First Sunday in the year; but if this Sunday falls on January 1, 6, or 7, the feast is kept on January 2. This feast marks no progress in the development of the Church year. It merely embellishes the occasion just observed when the Child received the Name Jesus as had been foretold by the angel. The feast is meant to impress on us Christians the dignity of the Holy Name. It is a relatively new feast, stemming out of devotional piety. Nevertheless, it is not difficult to find in it some liturgical or ancient Christian dogma. What did a name signify originally? The name should express the nature of a thing. Thus Adam in paradise gave the animals names in accordance with their being. Among the Jews God's name expressed His essence, Yahweh, i.e., I (alone) am who am (and cause all else to be). The Jews had the highest respect for the name of God, a reverence that finds continuation in the Our Father: "Hallowed be Thy Name." Persons who played prominent roles in the history of salvation often received their names from God Himself. Adam — man of the earth; Eve — mother of all the living; Abraham — father of many nations; Peter — the rock. The Savior's precursor was given the name God assigned him. According to divine precedent, then, the name of the Redeemer should not be accidental, of human choosing, but given by God Himself. For His name should express His mission. We read in Sacred Scripture how the angel Gabriel revealed that name to Mary: "You shall call His name Jesus." And to St. Joseph the angel not merely revealed the name but explained its meaning: "You shall call His name Jesus, for He shall save His people from their sins." The Messiah should not only be the savior, but should be called Savior. With Jesus, therefore, the name actually tells the purpose of His existence. This is why we must esteem His name as sacred. Whenever we pronounce it, we ought to bow our heads; for the very name reminds us of the greatest favor we have ever received, salvation. 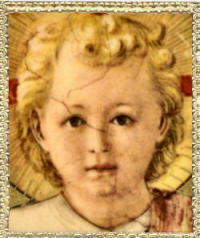 His name was called Jesus, which was called by the Angel before He was conceived in the womb." LUKE ii. 21. 1. It is not difficult to meditate upon the Holy Name, or to use the Holy Name in prayer. More than any other name, perhaps alone among all proper names, it is appropriate to the One Who owned it. Usually the names of men are given at random; they mean nothing in themselves; a man who happens to be called John might just as well have been called Thomas or William; the mere name tells us nothing about him; it is a convenient means of distinguishing him from others, a label put upon him and little or no more With a few human beings it has been otherwise: Adam, Abraham, Josue, John the Baptist were given names that signified the men on whom they were bestowed. But with none is this so true as it is with our Lord and Saviour Jesus Christ. With care the Angel impressed it on His Mother's mind: "Thou shalt call His name Jesus," he said, and there followed the description of His future greatness. With care it was repeated to Joseph: Thou shalt call His name Jesus, for He shall save His people from their sins. 2. The Name stands as a complete summary and description of our Lord's character and office, and it is under this aspect that it has been regarded by thousands of saints, whose hearts have melted at its mere sound. To them Jesus is their God, Jesus is their King, Jesus is their Redeemer, Jesus is their Mediator, Jesus is their Saviour, Jesus is their great Priest, Jesus is their Intercessor, Jesus is the Captain under Whom they fight, Jesus is the Leader Whom they follow, Jesus is their Teacher, Jesus is the Giver of their law, Jesus is the Spouse and Shepherd of their souls, Jesus is their Light, Jesus is their Life, Jesus is the Judge before Whom they rejoice to think that they must one day stand, Jesus is their final and eternal Reward, for which alone they live. 3. But He is also to them the mirror of all the most glorious and winning virtues. He is, and His Name tells them that He is, unbounded Charity, infinite Mercy, extremest Kindness, deepest Humility, most devoted Piety, transparent Simplicity, uttermost Poverty, Chastity without a stain. It is the prerogative of love to transform those who love into the likeness of Him Whom they love; and as the mere name of one who is loved cannot sound in the ear or be thought of in the mind without adding to the love which is already there, so the thought of the Holy Name and the mention of the Holy Name have a kind of sacramental power in the hearts of His saints. They seem to convey the grace which enables men to think like Him, to speak like Him, to act like Him, to sacrifice themselves like Him, and to Him, and for Him, and along with Him, to make Him known to others, not by word only, but also by reproduction of Him in themselves, and to win all men to love Him. Bless the Lord, O my soul, and let all that is within thee bless His Holy Name. Bless the Lord, O my soul, and never forget all He hath done for thee. Ps. cii. i, 2. 1. The great saint of the Holy Name is St. Bernardine of Siena. In his missionary expeditions he carried it on a banner, and used it continually in his sermons. He has a long treatise on the Holy Name, which teems with matter for prayer. The Holy Name, he says, is first of all fruitful for beginners. For these, for sinners, " it shows the immense mercifulness of God, it enables a devout man to gain a victory in every conflict, whether with the devil, the flesh, or the world, it has the power of healing sickness when rightly used, it fills with joy and exultation those who are in any adversity." He quotes St. Peter, that "through His name all receive remission of sin who believe in Him"; St. John : "Your sins are forgiven you for His name's sake"; St. Peter again: "There is no other name under heaven given to men whereby we must be saved"; the prayer of the Church in the Acts of the Apostles, that God would "stretch forth his hand to signs and cures and wonders, to be done by the name of thy only Son Jesus"; the further statement in the Acts, that the Apostles went forth "from the presence of the Council, rejoicing that they were accounted worthy to suffer reproach for the name of Jesus." 2. Next it is fruitful for the proficient. "It is cherished in their hearts and fed upon by faith, it is taken into their mouths and preached or spoken about, it is made the spring of their actions, which then become a great accumulation of merits, it is appropriated in a new way by perseverance, and then it becomes a principle of abiding and enduring life, the remedy of the frailty and fickleness which belong to our poor nature." By virtue of this Holy Name, he tells us, we ourselves have become the sons of God. In the virtue of this Holy Name St. Paul placed all his hope of doing good. The power of the Holy Name is the power of the Holy Ghost. And for its power of endurance he asks: "Art thou not refreshed as often as thou rememberest the name of Jesus? What is there equal to it for the feeding of the mind that thinks of it, for repairing weariness, for strengthening virtues, for nourishing good and upright ways, for fostering true affections?" 3. Lastly it is fruitful for those whom he calls the perfect. The first fruit is "the sweetness with which those who meditate upon it are filled," according to the beautiful rhythm of St. Bernard, Jesu dulcis memoria. The second is the wonderful power which this Holy Name gives to the prayers and petitions of the devout soul. The third is the immense sweetness which it gives to those who continually renew its memory. The fourth is the triumph and glory which it will produce in eternity: "They shall glory in Thee, all who love Thy name/ And thus for the sake of the name of Jesus the whole soul will live, and be endowed and enriched and beautified with all its powers; it will be made like to God three and one, united to Him, enlightened by Him, and plunged in perfect peace through Him, for it is to live for ever in the state of perfect bliss, furnished with the accumulation of all good." St. Bernardine of Siena (feast May 20) promoted devotion to the Holy Name of Jesus. From the Catholic Culture Library: St. Bernardino Fostered Holy Name Devotion.